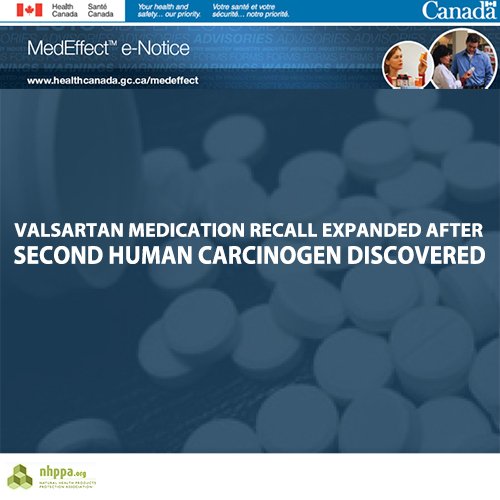 On September 12, 2018 Health Canada released a MedEffect Notice advising of an additional recall of certain medications containing Valsartan sourced from Zhejiang Huahai Pharmaceuticals in China. The original MedEffect notice regarding Valsartan, released on July 13, 2018, warned consumers that several products had been found to be contaminated with N-nitrosodimethylamine (NDMA), a known human carcinogen. In August, the recall grew to include additional products suspected of containing NDMA. Now, Valsartan products have been found to be contaminated with a second probable human carcinogen called N-nitrosodiethylamine (NDEA). NDEA is formed through chemical reactions from the mechanical processes involved in creating this synthetic product. Toxic to the liver and other organs, Valsartan contamination with NDEA is another example of the pharmaceutical industry’s failings. Consistent with the original notice, Health Canada is instructing patients currently taking an affected drug to continue to take it, escalating their risk of developing cancer, unless their physician offers other instructions. Many Canadians are not educated in how to advocate for their own health and may never speak to their doctor about the recall. Those who do, at best, will be prescribed a different drug to manage their symptoms. They will not be informed about the safe, natural options available. Health Canada’s new regulatory changes will push natural health products even further away from the public’s reach. Many, including Traditional medicines used for generations, will be exiled due to a lack of mandated evidence garnered from unaffordable double-blind studies to prove they are safe and effective. Find out more about how Health Canada’s proposed new regulations will restrict your ability to retain control over your health choices.